The importance of of building high-quality links has never been higher as the landscape of SEO and link building is always changing. Link building is the process of acquiring hyperlinks from other websites to link back to your own website. Search engines like Google use links to crawl the web, crawl the links between the individual pages of a website, and crawl the links between entire websites. Before you begin to understand the importance of link building, it’s important to understand how the basics of how a ink is created, how search engines like Google see links, and what they can interpret from them. The start of link tag (“<a”) is called an anchor tag. The link tag and tells search engine that a link to something else is about to follow. The “href” stands for hyperlink referral. The text inside the quotation marks (href=“https://draintony.com/basement-waterproofing”>) indicates the URL to which the link is pointing. The text inside the quotation marks could also be the address of a file or image to download. This is the text (“Basement Waterproofing”) that users see on the page. If they want to open the link, they need to click on the text. The text is usually formatted with blue and/or underlining to stand out from the text that surrounds it. The closer of link tag (“</a>”) signals the end of the link tag to the search engines. There are 2 ways that search engines use links: to discover new web pages and to help determine how well a page should rank in their results. When search engines crawl pages on the web, they extract the content of those pages and add it to their indexes. Then they decide if the page should be ranked well for relevant keywords by looking at the content of the page, the number of links point to that page from external websites, and the quality of the external websites. Therefore, the more high-quality websites that link to you, the more likely you are to rank well for relevant keywords in search results. Don’t you want your business to show up on the top results in Google? 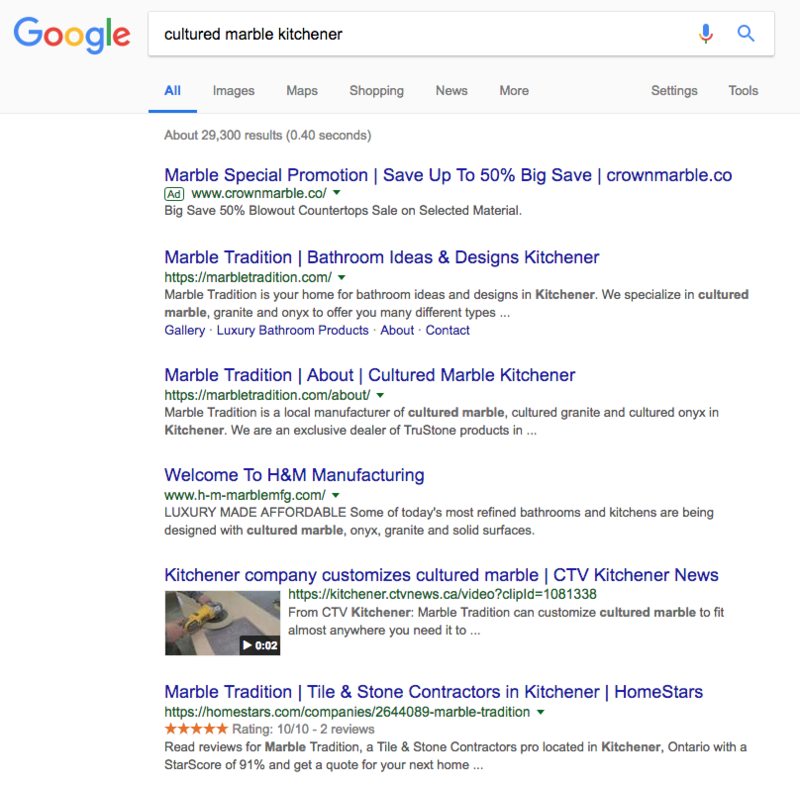 If you type in “cultured marble Kitchener” on Google, you’ll see Marble Tradition on the top results for this keyword. Linking building involves reaching out to relevant websites, blogs and influencers in your industry. For example, if you own an Italian restaurant in Mississauga, you should reach out to insauga. They write blogs about food, lifestyle, new openings, real estate, and many more. They are also the largest online media company in Mississauga with over 5 million reach per month. Reaching out to key influencers in your industry will help you build long-term relationships which will help your business become highly regarded and trusted. We know that the impact of links from high-quality websites impact your rankings, but what about the impact of those links on referral traffic? Wouldn’t having a good link from a highly-visited website lead to an increase in your traffic? The answer is yes. If you stumble across a blog by insauga about “The Top 5 Italian Restaurants in Mississauga”, wouldn’t you look into those restaurants (check out their menu and where it is located) and perhaps even going to eat at one of those restaurants? Therefore, if you have a link from a relevant website, chances are that the traffic is also relevant which can lead into an increase in sales. Create unique and high-quality content that people will want to reference and link to, and tell people about it. Don’t be afraid to put your business in front of influencers. Approach influences in your industry, such as bloggers or people with a large social media following about your product or service. Ask your friends and partners to link to your site. However, just make sure the links are from sites are in the same industry. This will have more value than links from random and unrelated sites.